Convenience Group, Inc., Lindian Enterprises Ltd.
All companies bidding on the project were required to install a sample of their film on a designated surface to allow the architect to judge the merits of the film on the glazed area. The National Gallery is a visual arts museum of international stature. It houses Canada's collection of historic and contemporary art within a creative building consisting of many windows and skylights that cast natural daylight upon the nation's treasures. With the United States Embassy less than 900 feet away, the Gallery is in a high security risk area. Propelled by the forces of a terrorist bomb, flying glass fragments were just one of the wicked elements that attributed to 220 deaths and approximately 4,000 injuries when terrorists attacked the U.S. Embassies in Kenya and Tanzania in 1998. 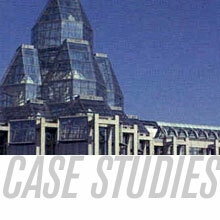 Both RCMP and Ottawa-Carleton Regional Police recommended the implementation of a "comprehensive window protection system" for exposed areas of glass. In addition to the technical security demands, there were also concerns about maintaining building aesthetics. The architect, Moshe Safdie, was concerned about the visual effects film may have on the transmission of visible light into the Gallery. Seven major North American companies were invited to bid on the project. The contract award was determined by using international technical standards developed with the assistance of Barry Weaymouth, an international safety and security consultant who provides his services for the Parliamentary Precinct and other buildings. After rigorous testing and the application of film samples, 3M-authorized Distributor Convenience Group, along with Ottawa-based Lindian Enterprises Ltd, were awarded the contract to install clear 3M Scotchshield Ultra High Performance Safety & Security window film on more than 5,000 of the Gallery's window surfaces. By strengthening the window surfaces, Scotchshield with Ultraflex anchoring will substantially reduce the effects of flying glass shards in the event of a terrorist attack on the embassy. "A building's weak link during an explosive event or attempted vandalism is typically its glazed surfaces or windows," says Ron Phelps, Project Supervisor, 3M Window Film Solutions, Specified Construction Markets. "The unique, tear-resistant, micro-layered structure of 3M Scotchshield greatly reduces the threat of serious injury by holding the broken pieces of glass together."